We are pleased to introduce the Mini-Vertical Series II, a self contained electronic height measuring and scribing instrument, now with direct RS-232 output and resolution to 0.00005"/0.001mm. 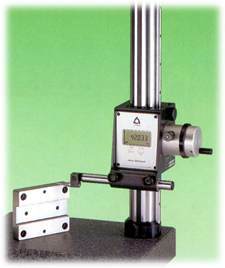 Designed and built by Trimos of Switzerland, the Mini-Vertical nicely fills the gap between our higer end Vertical Mark III and our standard shop height gages. Direct RS-232 output - No interface required!